Materials: slate, sand, rope, lemon essence, sound. Dimensions: m 3 x 13 x h 3. 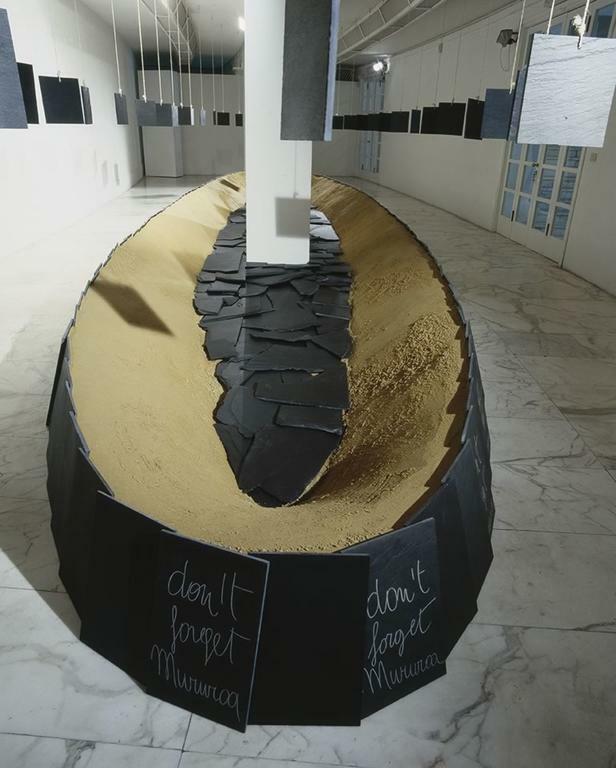 In the difficult space of the University museum, a curved, cold and rhetorical space, Maria Dompè forced attention on the tragic resumption of nuclear testing on the atoll of Mururoa. Including the two columns of the room, she created an oval form with the slate panels that contained six cubic squares of sand placed on the ground, and then another layer of slate but with cracked and fragmented pieces, as though they had been thrown down on the ground. 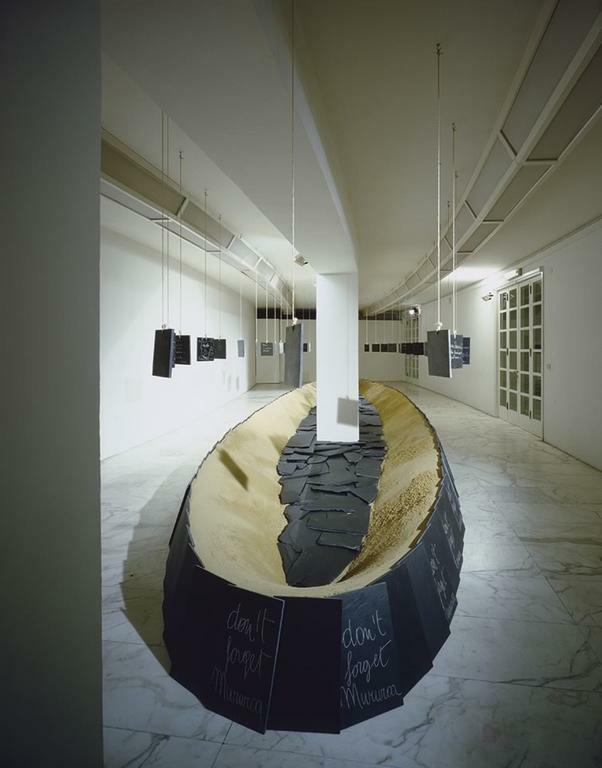 Resembling a ship by means of the shape and the two central columns that look like a ship’s masts, the incursion includes the entire space and in every dimension, with thirty-three square slate panels that hang by ropes from the ceiling and are intended to allow visitors to add their own testimony to the work. 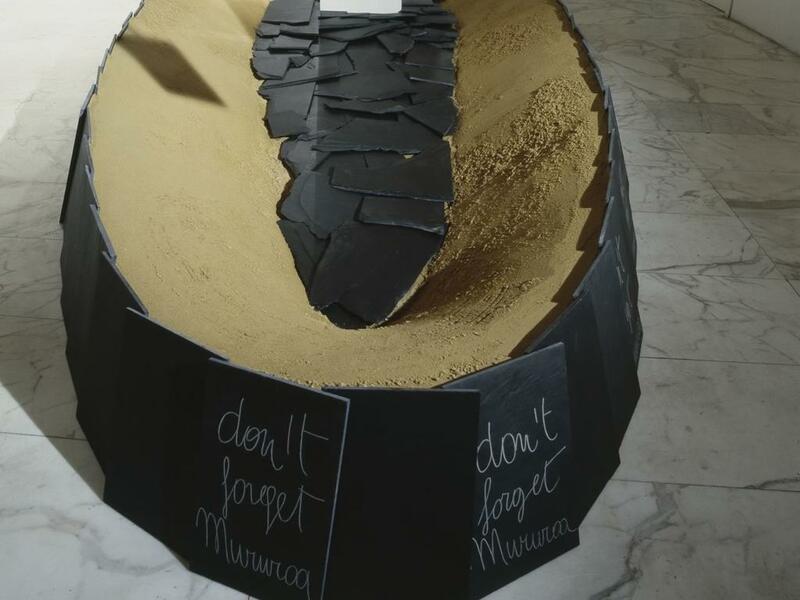 The visitors were immersed in a interior dimension, emphasized by the sound of a primordial ‘om’ heard throughout the room (and performed live at the inauguration and at the conclusion of the exhibition), by the absolute white of the museum space in chromatic contrast with the yellow of the sand, by the black of the slate interrupted only by the repeated inscription, ‘Don’t Forget Mururoa’, by the combination of the sounds and the odour of lemon essence. 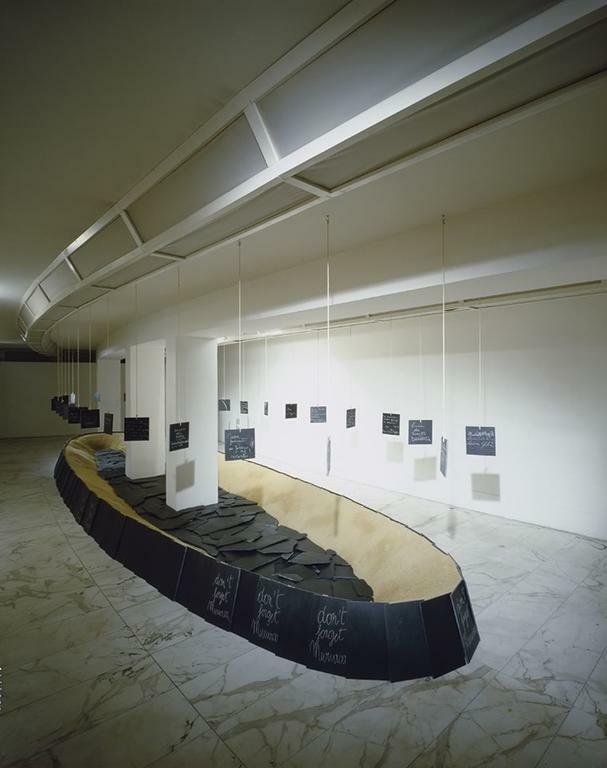 These aspects of the work involved the spectators in a fulfilment of the work that calls into use all of the senses and creates a moment of reflection on the nuclear tragedy that serves as warning to not repeat such catastrophic errors and to oppose death with a strong current of positive energy.